Located on the ancient Île de la Cité, Sainte Chapelle is a medieval symbol of Capetian power in the heart of Paris. Commissioned in 1239 by devout French King Louis IX (1214 – 1270) , Saint Chapelle once contained Christ’s Crown of Thorns, among many other Passion relics purchased by Louis to add to Paris’ prestige as a centre of Christian worship; the “New Jerusalem” of the north.The Crown of Thorns was held in Sainte Chappelle until the French Revolution when it was eventually moved to Notre Dame. The chapel was consecrated on April 26th, 1248 and was situated in the courtyard of what was then the Royal Palace. Louis IX was a benevolent, and pious king who sought to eradicate vices such as gambling, prostitution and usury during his reign. He was an avid patron of the arts and one of the key supporters of gothic art and architecture in France. Sadly, Sainte Chapelle was damaged in the upheaval of the French Revolution. From 1846, restoration work was carried out to repair the building to the way it is now. Fortunately, the beautiful stained glass windows were untouched and the chapel remains one of the best places to see examples of thirteenth century French stained glass. I suggest going early in the morning as there was a queue to get inside when I arrived at 10:00, however, the line up does move quickly, so it wasn’t that bad. Sainte Chappelle is run by the French gendarmerie so you will be searched prior to entry – like a mini-version of airport security. The cost is €8.50 for adults and free for under 18s. You can purchase an audioguide or go it alone. I did not get the audioguide and just enjoyed roaming around the chapel on my own. Good news: you are permitted to take pictures inside the chapel, and boy, did I ever take advantage of that! Be warned: it can get difficult at times to capture a decent shot with so many people crowded around you but I managed to take many nice photos of the chapel with a little politeness and plenty of patience. The chapel is open daily 9:00 – 17:00 from November 1st to February 28th, with late nights on Wednesdays May 15th – September 15th. 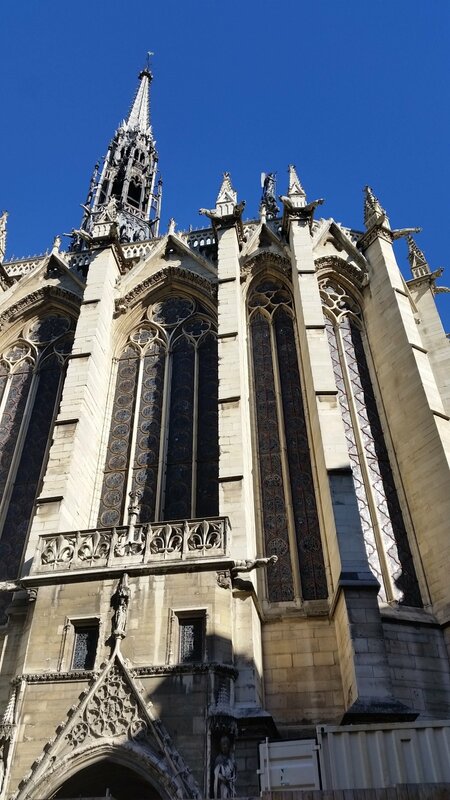 If you are visiting Paris, whether you’re a medievalist or not, it’s a definite must-see before you leave this fair city.